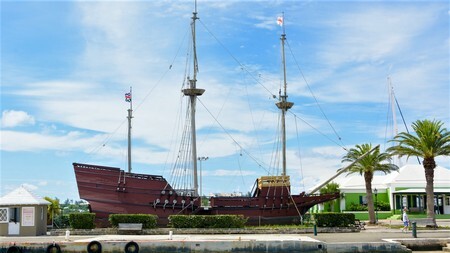 You will find a full size replica of the ship Deliverance in St. George's Bermuda. The replica of the ship is located at Ordnance Island just a short distance from Kings Square. It was in Deliverance and another ship Patience by which Somers and his men completed their journey to Jamestown of Virginia in 1610. Admiral Sir George Somers and his men were stranded at Bermuda after their ship Sea Venture strayed in a sever storm and got wrecked at a reef near St. Georges in 1609. They were in a fleet of nine ships that started from Plymouth of England heading towards Jamestown to create a new British settlement. But their ill fate separated them from rest of the fleet and stranded them in Bermuda. Strangely all 150 on board were alive even after Sea Venture crashed against a reef and they all came onshore at the St. George's area. They strangely found many hogs in the island which they could feed on and survive. Some say that the hogs were left by passing Spanish vessels to keep food provisions on their way. Over the next nine moths Somers' men built two ships, Deliverance and the Patience to complete their journey to Jamestown. In fact, they initially started to build only Deliverance, and soon figured out that it wont have enough capacity for all plus all the salted pork that they planned to carry with them. So they also started building the Patience. Salvaged remains of the ship Sea Venture and Bermuda cedar were mostly used to build the two ships. The rigging of Sea Venture was almost fully used up. Finally on May 10, 1610, Somers and his men started their journey once again for James town. Check out Alexandra Battery Beach to see the place where they built the ship Deliverance and finally launched it. By this time however, some members of the expedition had died and were buried in Bermuda. Somers left behind two men to retain British claim of Bermuda. When the rest reached Jamestown, they were shocked to see that only 50 out of the 500 men who reached there earlier had survived. Rest all died out of starvation. Somers returned to Bermuda using the ship Patience to pick up more food provisions. But on his return, Somers fell ill and died in Bermuda and could never make it back to Jamestown. To honor his last wishes, his heart was buried in Bermuda and body taken back to England. The full size replica of the ship Deliverance at St. George's is a vivid reflection of the maritime life of the 17th century. This 57-feet ship looks so small that it won't be considered sea worthy in today's time. If you go to the lower decks and see the life size dummy figures or mannequins in 17th century dresses, you will know how cramped life was inside the ship. There is also an audio presentation given inside to tell you about the history of the ship. Check out Bermuda Tourist Map for the location of Deliverance Replica. Nearby there is a statue of Admiral Sir George Somers built by the famous Bermudian sculptor Desmond Fountain. Deliverance admission fee for adults: $3, children: $2. Kids under 5 are free. Phone: (441) 297-5791. Special tours on Mondays and Thursdays at 1pm. A tea tasting party is organized at the Deliverance on certain days of the week (usually Tuesday, Friday and Sunday, 11am to 1pm). You can enjoy different blends of indigenously grown tea of Bermuda, sandwiches and baked goods (all made in Bermuda). A great way to enjoy with your family as you explore the ship. Email: [email protected] or call (441) 335-1958 for further info. Ordnance Island (a short Walk from Kings Square, St George). Bus #1, 3, 10, 11 operate between Hamilton and St George. You can also easily reach St George by Orange Route Ferry from the Dockyard (route operates April through November). 3) Check out History of Bermuda to know how Somers men started the first settlement in Bermuda.